When looking for a highly regulated US-based Forex broker, Forex.com will end up being one of the handfuls of choices that you have. This brokerage has the regulation found in the United States, which is some of the most stringent available for the Forex trader. Forex.com has been a registered Futures Commission Merchant, a Retail Foreign Exchange Dealer, and a member of the National Futures Association since 2004. Beyond that, Forex.com is a subsidiary of GAIN Capital Holdings Incorporated, which is listed on the New York Stock Exchange. However, there is much more to Forex.com than simply trading currencies. In fact, Forex.com is a bit of a “one-stop shop” for global trading from one brokerage account in general. While the main focus, of course, was initially Forex markets, the company has expanded quite drastically into various markets globally. More on this later in this ​Forex.com Review. When you trade Forex, one of the biggest concern that you will have is the available liquidity, and of course the ability of the counterparty to handle losses. GAIN Capital has total assets of $1.475 billion, total customer equity of $920.4 million, and available liquidity of $344.3 million as of Q2 2018. This makes Forex.com one of the most well-capitalized Forex brokers on the planet. Keep in mind that the US registry is crucial because the minimum regulatory capital requirement for GAIN Capital is $108.9 million, well below what is on hand. Comparing this to brokerages globally, Forex.com stands head and shoulders above them. With this type of liquidity and of course regulation, your trading capital will be protected as it takes so much in the form of liquidity and financial strength to get the designations that GAIN capital has been awarded in the United States, the United Kingdom, and other countries. 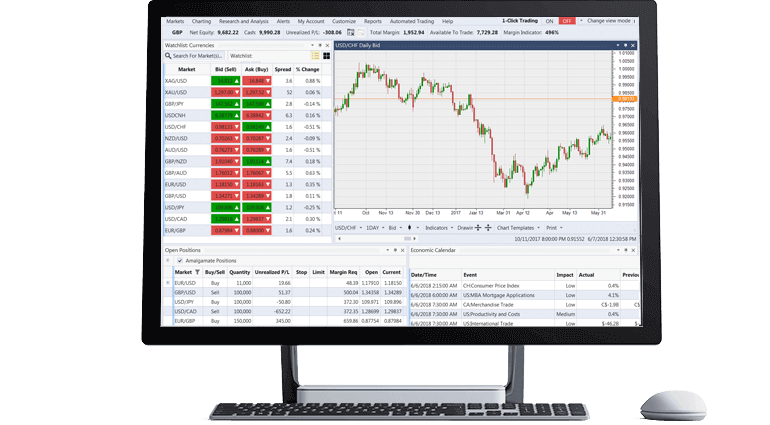 With Forex.com you use the popular Metatrader4 / MT4 platform. Because of this, most of you will have all of the experience needed to trade at Forex.com, and of course, if you have Expert Advisors you would like to use, you can just plug them into the platform. Forex.com also has the Forex.com Advanced Trading Platform, a proprietary trading platform that is quite functional and offers plenty of opportunities for customization and can suit your every trading need. This trading platform also has a mobile version that you can use on your cell phone as well. The ​trading software NinjaTrader is also available but must be requested, and Forex.com will get you set up with this powerful platform, which can be especially useful for those who like to write their own code when it comes to indicators. Finally, there is the web-based trading available as well, with the simplicity of charts being provided by Trading View. While the brokerage name is Forex.com, it’s not just currencies that this company offers. It offers gold and silver, CFD markets, as well as futures and futures options. Spreads on Forex pairs are variable and quite small. Notice, that during volatile market conditions the spread can be huge, so be even more careful then. Beyond that, you have the usual Forex pairs such as the EUR/USD, GBP/USD, USD/JPY, and so on. There are even exotic pairs such as USD/RUB, USD/SGD, and USD/TRY. ​Over 220 shares in the United States and the United Kingdom. ​​The margin on shares starts at 20%, while the margin on indices begins at 5%. Commodities require 10% margin, while cryptocurrencies require 50%. You will find that this margin is rather good compared to some of the other brokerages out there offering CFD markets. The futures side of the brokerage is different and separate though, so if you wish to trade futures contracts or options, you will need to open a second account. This company, known as FuturesOnline, is also a subsidiary of GAIN Capital. The pricing for futures contracts starts at $1.29 commission per side, per contract. However, if you wish to have telephone orders or pit trades, this can change the pricing structure. Pricing for data is reasonably priced, especially for non-professional traders using US markets. The CME is as low as one dollar a month, while the CBOT, NYMEX, and COMEX are roughly the same, with bundles being as low as $3.00, and $15.00 with the DOM. Keep in mind that margin may be different depending on your home country, as some countries allow for more margin than others. For example, in the United States, margin levels are typically much higher thereby making leverage much lower. However, on the futures side of the business, this is all standardized through the exchanges. Keep in mind that if you are a professional client, which is defined by precise criteria, you could be looking at margin as little as 0.25% on Forex trades, and 5% on cryptocurrencies as an example. While it is difficult to cross that threshold if your portfolio is big enough it certainly is worth looking into. ​Forex.com aims to deliver the best possible trade execution. The spreads are variable and tight in normal market conditions. However, in volatile market conditions, you have to be careful. The spread could increase conspicuously. Forex.com advertises with the argument, that their trading technology executes your trade at a better price if the market is going in your favor at the time of order execution. Trading Education is well documented at Forex.com, including technical analysis, fundamental analysis, and even some trading strategies. Beyond that, there are tutorials on how to use the trading platforms, a section on managing risk, and of course plenty of trading courses for beginner, intermediate, and advanced traders. They even go into developing a trading plan and have an entire tutorial section dedicated to that one aspect of trading, which is obviously very important. Market analysis is free, and Forex.com has a huge global research team that can help you identify potential trading opportunities. At any time of day, you will see a listing of the latest research, and various markets will be represented. Quite often, the analysis on Forex.com is featured on some of the world’s biggest financial websites. There are also live trading sessions in the form of 30-minute webinars that the global analysts at Forex.com offer, so that, of course, is another major benefit of using this brokerage. This allows you to see how the professionals view the market, and perhaps even how they trade the market depending on conditions, or sometimes even how they don’t trade if the market doesn’t warrant risking any trading capital, which of course is a significant lesson in and of itself. You will find support at Forex.com to be quite significant and helpful. Available 24 hours a day during trading days, you can contact via chat online, phone, and of course email. 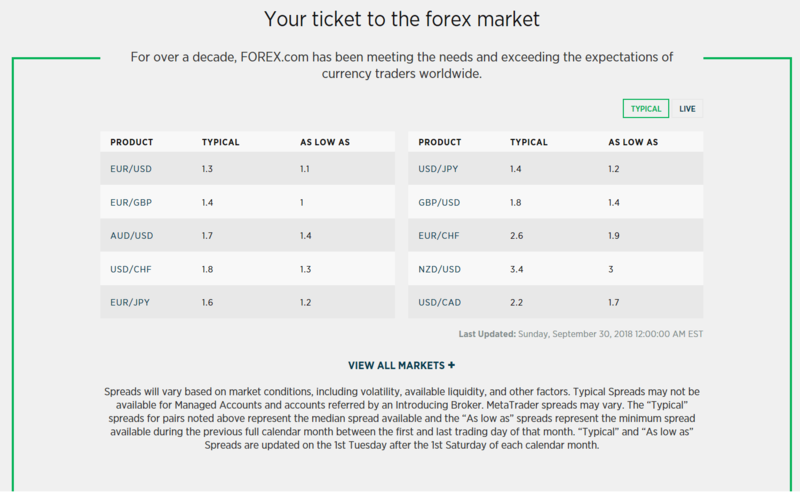 You can even find support directly from the Forex.com platform via tutorials, analysis, trading strategies, and account management. There is an FAQ section as you would expect, and then there is a download center for several publications and documents that you may need to open up an account. Forex.com offers a personalized market strategist and even trade signals for those who wish to receive them. Obviously, these are extra, but they are available. That being said, you will find that Forex.com has a stringent support staff that is very knowledgeable. However, if you have residency in a country like Canada or the United Kingdom, you have access to CFD markets that give you the world at your fingertips. Think of it this way: if there’s an opportunity out there, you should be able to capitalize on it. An obvious example would be something like trading the US Crude Oil market as well as the Canadian dollar. With the low amount of margin needed to trade the CFD market, this is a simple way to set up a real diversified portfolio offering plenty of opportunities from around the world and at different times of the day. Remember, the CFD market is open when the underlying instruments are. You also have the ability to easily short markets, not always the case with stocks and the like. You also have granularity, which gives you the ability to trade a handful of shares as opposed to going in with a minimum of 100. This is one of the most significant benefits of trading CFD markets. With the massive amount of regulation, the security of funds won’t be an issue either, which of course is a major benefit to trading with this company. Being around as long as it has, and being a big picture on Wall Street, Forex.com is one of the seemingly safest companies to deposit your money with. Gone are the days of the wild west, and now we have the emergence of brokerages such as Forex.com that have done everything right, offering plenty of safety of funds, information, and competing on the global stage for trading accounts. The spreads are tight, which of course allows for scalping strategies if need be. Beyond that, there are enough extras and support to keep you going.